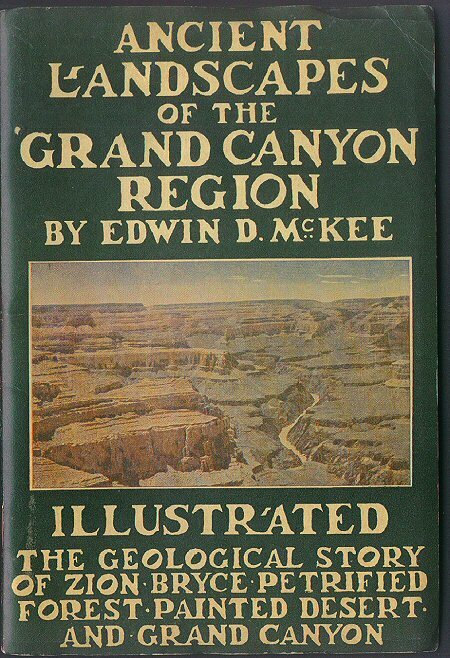 "Ancient Landscapes of the Grand Canyon - Edwin D. McKee - Copyright 1931 - 9th printing 1947. " (1645) Ancient Landscapes of the Grand Canyon - Edwin D. McKee - Copyright 1931 - 9th printing 1947. -Condition: Very Good Wonderful booklet that includes many B&W photos of the Grand Canyon area plus descriptive text. Chapters Include: The Archean Era, The Algonkian Era, The Paleozoic Era, The Msozoic Era, The Cenozoic Era, and much more. Very indepth look into the history of the area. There is a hand signature on the inside page with a date of May 1947. Outside cover is of thin cardboard and is larger than the inside pages. Booklet measures 5 1/2" by 8" and has 50 pages. Price: $9.00 + shipping.